Based on reviews from 71,640 users. Learn how our rankings work or see our guide to Puma sneakers. Updated Apr 2019. The Puma Group, long a global name in the athletic and apparel market, has been in the industry for nearly seven decades, having been founded in 1948. It owns the Puma brand as well as Cobra Puma Golf and Dobotex, an affiliate company that manufactures bodywear and socks for Puma and other brand-name companies. Searching for a particular Puma shoe but don’t know where to start? Or, are you struggling to find out which shoe would suit you the best? If you answered yes, then try our guide. We’ve divided Puma sneakers into three categories: by type, by cut, and by inspiration. This section is divided into two main categories: Sports and Lifestyle. Lifestyle - Puma sneakers under the vast lifestyle section are tailor-made for the fashion-forward. These Puma sneakers are inspired by athletic footwear but are built more for casual wear instead of performance, although several hold up well when used for sports. Puma sneakers also include sport-specific shoes that have made their way into the mainstream market due to their trendy designs. Running – This athletic category consists of trail, race, neutral, stability, and track spike shoes and apparel. Some of their running models include the Carson Runner and Ignite. Training - The training department features footwear, apparel, and accessories that provide a responsive workout and lets you maximize your energy as well as each and every one of your movements. Football - Puma football boots, which are further divided into the indoor and outdoor subcategories, are built for speed, accuracy, power, and efficiency to help you level up your soccer game. This division also includes soccer balls, jerseys, and socks. Golf - This range combines Cobra Golf’s golfing equipment and accessories with Puma’s sport-specific footwear and apparel. Motorsport - The motorsport division is dedicated to speed junkies and fans of clean lines and car-inspired designs. Aside from shoes, this range includes polos, track jackets, pants, and accessories such as bags and wallets. Puma sneakers can also be divided by shoe cut: low-top, mid-top, and high-top. Low-top Puma Sneakers - A low-top shoe is typically cut below the ankle. They are generally lighter than other cuts because they emphasize mobility and quickness. Mid-top Puma Sneakers - Mid-top Puma lifestyle sneakers generally don’t extend higher than the ankle. Puma sneakers of this cut give a bit more ankle support than low-cut footwear and several have lockdown features for stability. High-top Puma Sneakers - High-top Puma sneakers go significantly over the ankle. Many are commonly basketball-inspired or are specifically for playing that particular sport since high-tops are supposed to provide more ankle support and decrease risk of ankle inversion. Most casual Puma sneakers are generally inspired by athletic shoes. Basketball-Inspired - These shoes generally take inspiration from the silhouettes of classic Puma basketball shoes. Tennis-Inspired - Puma sneakers of this kind follow the clean lines and simple form of tennis shoes. Running-Inspired - These Puma sneakers take inspiration from the lightness and flexibility of running footwear which allow users to make various movements. Training-Inspired - These shoes take their cue from trainers that are designed to give comfort during intense workouts. Soccer-Inspired - These casual shoes take influence from classic soccer kicks but were given a trendier flair, fusing performance and aesthetics together. Motorsport-Inspired - These Puma sneakers feature the streamlined and aerodynamic design as well as the premium look of race cars. The Puma Clyde was released in 1973, born from Knicks’ point guard Walt “Clyde” Frazier’s request to the brand that a Puma Suede be made just for him but in lighter and wider form. Puma agreed and stamped Clyde’s moniker on the side of the new silhouette. The Clyde then became known as the first custom basketball sneaker. The shoe was also picked up by hip-hop circles and gained a cult following. It is one of a handful of Puma sneakers that quickly bridged the gap between performance and style. Since then the Clyde has seen various iterations and new colorway releases, one of which is the Clyde GCC. This premium version had a snakeskin-embossed soft leather upper, a rounded tip, contrast lining, and accent laces. The Puma Suede debuted in 1968 as a track and field shoe. It had a rounded silhouette, a thick rubber sole, and was made of suede which went against the traditional canvas or leather make of Puma sneakers at that time. Trendsetters in the sporting arena as well as in the fashion and street scene quickly embraced the shoe. The Suede further launched into fame when Tommie Smith won the 200m gold medal wearing the classic footwear. Tommie Smith’s raised fist, what is now called the “1968 Olympics Black Power Salute,” as the anthem was played with the Suede on the podium alongside his shoeless foot. It became such an iconic moment in history. By association, the Suede carved its own historic moment as well. Many Puma sneakers today took inspiration from the Suede. The Disc Blaze debuted in the early 90s and was designed mainly for the sport of track and field. The shoe had an internal wire system (called the Disc) that allowed the shoe to be lace-free. With a few twists, the Disc dial mechanism could tighten the fit at a fast speed. The Disc Blaze was deemed to be the world’s first sports shoe that was laceless. The shoe’s sole also used the Hypalon, a new material that offered lighter and better cushioning than neoprene-based soles. Puma’s unveiling of the Disc tech promised to deliver something unseen before on Puma sneakers. Despite the high price tag of about $75, The Disc Blaze was a hit. Due also to its solid performance, Puma rolled the Disc technology across various other sports such as tennis and basketball. A new Disc version was released the year after—the Disc Spike. This shoe was worn by Heike Drechsler when he won the Barcelona Summer Olympics gold medal for the long jump. A few collaborations also came after, including the Disc Blaze x BAPE, which was decked in the trademark BAPE camo print and had the Disc prominently displayed over the tongue area. The Basket was released by Puma in 1968 as the all-leather counterpart to its velvety cousin, the Suede. It originally served as a warm-up sneaker for basketball practices but became popular in the hip-hop scene as well. Since it became a street culture icon, the Basket has seen many new colorway releases as well as much collaborations. Other versions were released too such as the women’s exclusives Puma Basket Platform and Puma Basket Heart, the Puma Basket Classic which is available for both men and women, and the men’s Puma Basket Classic Winterized. The Match is Puma’s first ever professional tennis shoe which debuted in 1974. It was the brand’s answer to Adidas’ Stan Smith with its clean and minimal design, slim silhouette, and white-based upper. It was also one of the few shoes made in Europe which guarantees superior quality. Many Puma sneakers carry the Match’s simple and slim design. In 1948, the same year that Puma was officially founded and registered, the company released the Puma Atom. Several of West Germany’s football team wore the football boots in their match against Switzerland. The Germans won and Herbert Burdenski, one of the players who wore the Atom, scored the winning goal. They followed up the Atom with the Super Atom in 1952. The Super Atom was a football boot with screw-in studs developed by Puma with the help of West Germany’s national coach, Sepp Herberger, and a few others. It also started Puma’s hugely successful foray into football. 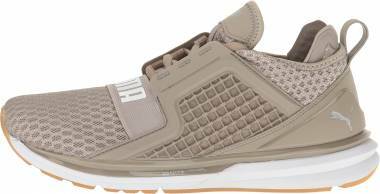 This footwear is a basketball shoe made exclusively for women with a suede upper and contrast color Formstrips on the sides. Only a handful of Puma sneakers has been remade into different iterations throughout the years, from slip-ons to platforms, than the Vikky. The Puma Vikky Platform that was released in 2016 is one of the latest iterations of the classic. It still possessed the sporty look of the original along with the same suede material. The newer version, however, had a chunky platform sole and a SoftFoam insert. This footwear was launched in 1968 to honor the Italian national football team which won the UEFA European Football Championship. The original Roma, though, was designed to be a running shoe made more for sprints and hurdles in the sport of track and field. The shoe was reissued in the 2000s with better arch support and a padded tongue. It also had a synthetic leather upper. Cool-looking Puma sneakers with a hint of retro style take some of their cues from the Roma. Its latest iteration, released in 2017, is a high-end makeover from the creative director of Bottega Veneta, Tomas Maier. The Puma Roma x Tomas Maier collaboration features a white leather upper, a gum sole, and Maier’s brand logo—a palm tree—embossed throughout the shoe. It also had gold-toned branding and serrated detailing. It is one of the most sought-after collaboration of Puma sneakers. This iconic footwear is considered to be one of Puma’s finest running shoes. Launched in 1993, the Blaze of Glory had a clean silhouette with a one-of-a-kind lacing system that was both stylish and functional. It also utilized Puma’s Trinomic cushioning technology. The shoe did not feature Puma’s distinctive Formstrip on the shoe’s upper although a cat logo can be seen on the heel—the shoe’s only brand reference. In 2007, an updated version of the B.O.G was released through a collaboration with Sneaker Freaker, an Australian indie magazine. It had shark-inspired colorways called the Black Beast and Great White. A few others followed including the Blaze of Glory Athletic and Blaze of Glory Sock Core, both 2016 releases. Puma sneakers are known for their innovation and unique style. In recent years, Puma has sought to further expand their influence into the lifestyle and fashion scene by partnering with designers, artists, and popular figures. Some were just one-off collaborations of Puma sneakers but others progressed into an entire line. Puma x Rihanna Suede Creeper - Rihanna’s first collection with Puma was titled, “Fenty” which is Rihanna’s last name. This collection debuted with a shoe called the Creeper, a kind of remake of the Suede but with a thick, platform-like gum sole. The Creeper dropped in September 2015. Around 3,000 pairs of the shoe were sold on the brand’s website within an hour of its release and more than that across the U.S. in a half hour. 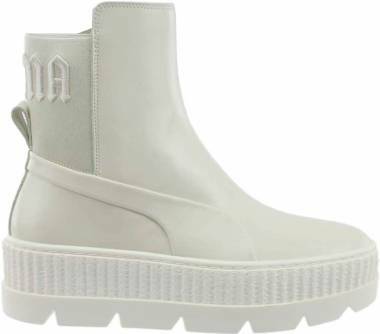 Puma x Rihanna Creeper White Leather - This Creeper variation was launched in the first quarter of 2017. The silhouette had a white upper with a black heel panel and Formstrips on the sides as well as Rihanna’s signature gold metallic branding. Puma Fierce Core - This is the model that debuted the Fierce shoe range. It was released in-store and through the brand’s website. It was a hugely successful release with some colorway sizes selling out within minutes. The Fierce Core is a lightweight slip-on shoe made for rigorous training. It had an amazingly sleek look and riveting design. The footwear had a demi upper bootie construction with caging and mesh overlays for maximum stability, lockdown, and support. Pull tabs at the heel and tongue allow the wearer to easily slip it on or off. Puma Fierce Knit - This Puma footwear is an updated version of the original, the Fierce Core. Released as part of Puma’s “New Year’s Resolution” pack, it debuted in stores on January 19, 2017. It featured most of the same details as the original except for the upper which was made of lightweight knit material. It was built for intense training such as endurance and strength-building activities. In September of 2017, Selena Gomez was announced as a brand ambassador of Puma sneakers and in November of the same year, the Phenom campaign kicked off. The first Phenom shoe was launched in three colorways: black, pink, and olive green. Puma Phenom - These were designed for high-intensity workouts and are billed as “fashionable, functional, and fearless.” The Phenom is a definite eye-catcher that does not lag on the specs. It boasts of a lightweight IMEVA and an IGNITE heel drop-in midsole. A full-length vertical flex groove at the outsole gives the sneaker enhanced agility while the herringbone rubber provides improved ground traction. The Puma Phenom is geared to give a quick response, flexibility, balance, and maximum traction. The high top design gives additional support for the wearer’s ankle while the mesh collar insert improves the shoe’s ventilation. Puma had collaborated with the renowned and late designer, Alexander McQueen, on a number of Puma sneakers. The Spring/Summer of 2006 unveiled the Puma by Alexander McQueen line. Puma Spine Mid Velcro - This Puma sneaker came out along with other models in McQueen and Puma’s F/W 08 collection, which is inspired by the human anatomy, particularly the human foot’s toe prints, vein formations, and tendon structures. The Puma Spine Mid Velcro has a rich white leather upper and four velcro straps for better lockdown. The shoe has a white grooved sole as well. Puma Ribcage Lux - Like the collection from the year before, Spring Summer 2009’s Puma and Alexander McQueen collab again takes its inspiration from the human anatomy. This time, the focus is on the structure of the human ribcage. This Puma sneaker has a sock construction for easy on and off. The upper is made of a technical mesh, and an embossed leather eyestay mimics the human ribs. The outsole, meanwhile, is made of transparent TPU. Sophia Webster is a British designer of accessories and footwear who launched her own shoe line in 2012. Conde Nast Footwear News hailed her in 2013 as “Emerging Footwear Designer of the Year.” She was also the recipient of a few awards by different bodies. In 2017, Sophia Webster signed up with Puma to design a collection of trainers and womenswear. Her collection was first released through her website in September and sold out within a day. On the 9th day of the same month, the collection dropped in Puma stores worldwide. Puma x Sophia Webster Suede - The iconic Puma sneaker, the Suede, got another makeover in this new colorful version. Following Sophia’s feminine side, the Suede is transformed into a brightly hued footwear with a translucent and multi-speckled outsole. A unicorn branding can be found on the heel of the left side of the shoe while the Puma cat branding is placed on the right side. It is available in three colorways: Illusion Blue and Fluo Yellow, Crystal Rose and Fiery Coral, and Spectrum Blue and Knockout Pink. Puma x Sophia Webster Pearl Cage - Like the Sophia Webster Suede collab, this Puma sneaker also sports the same bright hues. A multi-colored speckled outsole is combined with a knitted sock construction upper. Candy-colored cage detailing gives the shoe added stability and support while the sleek pearl trim adds style. Unicorn branding decorates both shoe heels. Puma Blaze of Glory x Careaux - Caroll Lynn effectively combines functionality and art with this classic silhouette. This version features a perforated leather and mesh upper, a socklike build, and the Puma Trinomic tooling as a homage to the 90’s running technology. It also contains Careux’s symbolic rose print, which she called the “Dedication Flower,” on the upper and a flowery graphic on the insole. Puma Suede x Careaux - The old favorite, the Suede, has been reworked this time to feature a perforated Puma form stripe, a gold design on the heel, and speckled midsole. The whole shoe is draped over with luxurious suede. Puma Mostro x Careaux - Careaux transforms the futuristic style of the Mostro into a more exquisite and dreamy design. The shoe comes with Careux’s trademark rose in the form of a patch and is covered in either a black or woodrose colored suede. It also features the Mostro’s traditional zigzag closure. Legendary designer Jeff Staple signed up with Puma in 2013 to create a whole new collection. First popularized in his 2005 Nike SB Pigeon Dunk Low, Jeff returns with the same signature pigeon design in collaborations with the German athleticwear giant. This pigeon trademark is supposed to signify triumph against all odds. Puma Blaze of Glory x Staple - In this model which came out during the summer of 2016, Staple gives the B.O.G. a “Pigeon” color-blocking scheme made up of white, black, grey, and pink. The model is dressed up in a combination of suede and mesh with a speckled pink and grey midsole that utilizes the Trinomic technology. Puma Suede x Staple - Jeff Staple first worked with Puma in 2013 for their project entitled, “Puma Pigeon Suede.” This Suede iteration was first released on April 17, 2013 at New York City’s Reed Space and had a worldwide release on May 3 of the same year. It was handcrafted in Japan for Puma under their “Made in Japan” campaign and only 500 pairs were made. The Suede in this 2013 version was reworked with tonal grey suede all throughout while orange accents finished off the look. It featured Staple’s signature Pigeon on the heel and an embossed Puma Pigeon lettering on the side. For the summer of 2016, Staple and Puma once again collaborated on the Suede. This time around, pink color blocking is applied to the heels of the white, grey, and black colorways. The predominant-color of the shoe represents regions. “Star White” colorway is for the Americas, “Pure Black” for Asia Pacific, and “Frost Grey” for the Middle East and Europe. Since Puma’s inception in 1948, the athletic wear and lifestyle company has been one of the leaders in innovations concerning sports. Listed here are some of their technologies along with the shoes that utilize them. The upper is the part of a shoe that covers the top and both sides of the foot as well as the back of the heel. For Puma sneakers, this part includes the tongue, quarter, lining, lacing, and more. The evoKNIT in Puma sneakers is a woven upper that provides a flexible, lightweight fit for Puma sneakers. The knit has a dense structure which gives the wearer surprising support yet is slightly stretchy to accommodate the shape of your foot. Puma Ignite evoKNIT - Launched in 2016, the Ignite is the first shoe to use the evoKNIT technology. This Puma sneaker featured a striking evoKNIT color, nylon straps for enhanced support for the ankle and heel, and a responsive EVA foam grooved midsole. Puma Duplex EvoKNIT - This retro-style low top shoe is an iteration of the classic 90’s running footwear, the Puma Duplex. Originally made of suede, the Duplex was reimagined into a sleeker and more streamlined version by the use of the evoKNIT material on the upper. NETFIT is a customizable lacing system from Puma sneakers with at least five lacing options you can choose from: wide foot, narrow foot, stability, standard, and heel support. The Standard option is for runners needing only a minimal level of support, Wide is for wide-footed people who might need extra shoe room, Stability is for extra medial support, Heel is for runners who would like a tighter fit around the heel area, and Narrow is for narrow-footed users. The NETFIT from Puma sneakers also lets users create a fit that is customized entirely to their foot, allowing them to be creative as well. The shoe’s upper is covered with a netting where every hole can be laced according to your preference, providing versatility in terms of style and comfort. Puma Ignite Netfit - The Ignite Netfit is a combination of several of Puma’s innovative technologies. The upper of this Puma sneaker is covered with Netfit, the midsole contains the Ignite foam tech which gives the shoe shock attenuation and responsiveness, and the outsole’s EverTrack+ provides a durable and strong grip on most kinds of surfaces. evoSPEED NETFIT 1 - This particular shoe is specifically designed for indoor athletes who need speed. A form-fitting upper gives this shoe a snug fit while the NETFIT lacing system provides you endless lacing options to choose from. IGNITE foam inserts, which give energy return and cushioning, nicely rounds up this footwear. The midsole is the part of the shoe that is between the insole and the outsole. This part provides the cushioning and shock absorption as well as houses various specialized technologies of Puma sneakers. The Puma NRGY Beads are free-floating beads that give an enhanced level of shock absorption, support, and energy return. The beads adapt to every step you take to provide you tailored cushioning and unrivaled comfort every time. 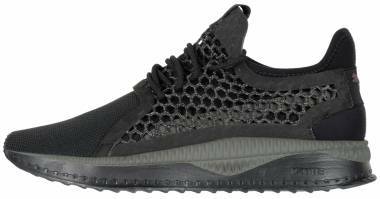 Puma Jamming - Released November 9, 2017, the Puma Jamming is the first shoe to use the NRGY Beads technology. The shoe features a transparent midsole filled with NRGY beads, an evoKNIT sockliner, and a lacing system that gives the shoe slip-on accessibility. The shoe released in a black and forest green colorway (Forest Night) with five more iterations to be released in 2018. The IGNITE Foam is a high-rebound cushioning technology from Puma sneakers that is both responsive and flexible. It is made out of polyurethane foam instead of EVA and is excellent at dispersing impact and providing superior energy return. It also does not break down over time. Puma Ignite Limitless - The Ignite Limitless was released on February 2 of 2017. It is a performance-tailored Puma sneaker designed primarily with style and comfort in mind. The shoe has a stretch neoprene construction with a forefoot strap and a stability cage for enhanced support. It also features an IGNITE foam midsole and reflective detailing. Puma 698 Ignite - The Puma 698 is a new silhouette inspired by the classic Puma R698, a running shoe. It was released in 2016 as part of a pack named ‘Old vs. New.’ Instead of the original Trinomic cushioning sported by the R698, the 698 Ignite sports the IGNITE Foam which gives optimum energy return. It also has a sleeker and more minimal look. This technology first came out in 2009. The 10CELL provides a responsive bubble that is divided into two cushioning zones. The bottom part is made to be more flexible to absorb impact while the top half is created to be firmer to allow the foot to rebound. Puma Cell Surin 2 FM - The Cell Surin 2 FM is a newer version of the original Cell Surin. It has a sleek leather upper, lace closure, perforation details, grippy rubber outsole, and the 10CELL technology for maximum heel cushioning. 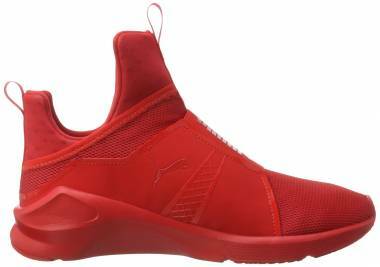 Puma Cell Voltra - With the Cell Voltra, the 10CELL technology is showcased in a functional and performance-based shoe with a hint of sleek style. This footwear has a visible air-filled unit made of TPU, breathable mesh upper, an EVA midsole, and a removable foam insole. Synthetic overlays provide additional foot support. The outsole is the lowest part of the shoe that directly comes in contact with the ground. It can be of various materials such as leather but is most commonly made of rubber. The outsole of Puma sneakers can provide more grip and traction based on tread pattern. The SpiderCELL is an outsole technology that is developed for Puma sneakers with the help of the engineering and design team of Essential. They created a modular outsole using a matrixed cell approach that returns kinetic energy to the user and absorbs impact and shock. The result is a superior outsole that is also visually unique. Puma Cell Cerano - The Cell Cerano is a sleek running shoe with a leather upper, perforation details at the toe box and sides for breathability, and the Spidercell outsole. A Formstripe in shiny patent adds flair to the silhouette. Puma Cell Cerae II - The Cell Cerae II Puma sneaker has a combination of breathable mesh and synthetic fabric for its upper. A Spidercell heel gives the shoe optimal cushioning while bright-colored contrast piping outlines the Puma Formstripe for added style. The DuoCELL is a midsole technology wherein cells work as a single unit to cushion impact. With Inverse DuoCELL, Puma with the help of the company Essential, relocated the cell cushioning units to the outsole and turned them upside down. The cells became elongated and now work independently of each other in reacting to the ground. The result is a ride that is customized to each of the wearer’s foot strike and the terrain. Puma Cell Meio - This 2008 dress shoe-inspired footwear combines functionality and aesthetics. The Cell Meio has a synthetic and leather upper, Inverse DuoCELL at the forefoot and heel, perf details on the upper, and Puma logo at the heel. The EverRide and EverTrack are both rubber materials for the outsole of Puma sneakers. The EverRide is designed to provide extra cushioning while the EverTrack element, which is abrasion-resistant, is made to give the outsole added durability, particularly on high-wear areas. Puma Carson Runner - The Carson Runner, released October 2014, is a dynamic-looking running shoe with a dash mesh upper, an EverRide and EverTrack rubber outsole, die-cut EcoOrthoLite sockliner, and EVA midsole. The shoe is a combination of traction, comfort, and durability. Puma Valor - The Valor is a lightweight trainer with perf detailing and synthetic overlays. It has extra reinforcement at the toe, EverTrack at the heel for enhanced sturdiness, EverRide in the forefoot for more grip, and a full-length molded EVA midsole. We’ve compiled a few facts and information about the brand that may interest you. How do you differentiate between a fake and an original Puma lifestyle shoe? Logo - The Puma logo must be present both on the sole and the heel of the shoe. The logo must be properly bonded and not merely printed. The Formstrip must be smooth and symmetrical. If it is not, it is generally fake. Stitching and Craftsmanship - Puma, like most premium brands, are particular with the craftsmanship of their casual sneakers. The sewing margin is usually 1.5mm, and spacing is 1.2mm. The needles per inch are 9-pins. Everything should be symmetrical, and there should be no broken stitches. Color - Always check the official website for the colorways available for each shoe. Any odd color may be made in the same factory where Puma shoes are made but may not be sanctioned by Puma. Flexibility - The soles of Puma sneakers are generally flexible. Unless they’re Class A fakes, cheap knockoff ones usually have rock hard soles that can’t be flexed. Tongue Label - Puma sneakers generally have labels underneath the tongue with details of the shoe (where it was produced and so on) as well as a code. Quality - The materials Puma use to produce each shoe are strictly checked. They will not use low-quality materials. If the material of the shoe you bought feels cheap with colors that easily fade, it’s most probably a fake. How popular are Puma sneakers? According to a 2017 customer satisfaction index of American consumers, Puma has a rising index score of 81 which is similar to Adidas’ and higher compared to Nike’s 79. Can women wear Puma sneakers designed for men and vice versa? Yes, of course, but do take note that men and women’s sizes differ by approximately 1 ½. A size 5 in men will translate to around 6 ½ for women while a woman’s size nine shoe is around 7 ½ in men’s sizing. Remember though that sizes can vary per model or shoe and that men’s shoe widths are wider than women’s. Can I use my Puma sneakers for sports or fitness activities? 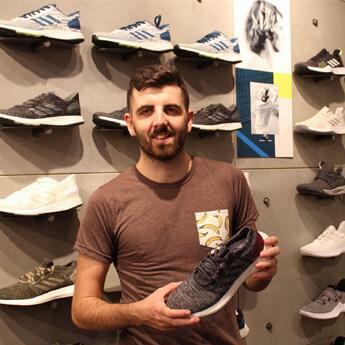 To make sure your sneaker lasts you a long while and to ensure your safety, use a shoe that is specifically designed for the sport you’ll undertake. Some sports require shoes that provide good grip and ankle support, some require lightness, while still others demand good cushioning. That being said, there are a number of lifestyle sneakers based on sports-specific shoes that do okay when used for that particular sport. There are also several lifestyle shoes that function quite well for working out in the gym. I suffer from knee pain. How do I choose which Puma sneakers are right for me? A recently published study shows that footwear with flat, flexible soles significantly reduce the load on the knee joints when compared to shoes with a stabilizing effect. Choose a lightweight shoe that would allow your feet optimal movement. Also, it should have excellent cushioning around the heel and ankle. Examples of this would be the Puma 76 Runner models. I’d like to buy a Puma sneaker but how do I know which one gives a good grip? Check the shoe’s outsole. The outsole should be made of soft rubber which should help it grip more efficiently to slick floors. Shoes with stiffer outsoles or those made of other compounds will not be able to grab hold on slippery surfaces. Look at the tread pattern as well. Enclosed treads will trap liquids in it and will form a barrier between the floor and your shoe. However, interlocking patterns that don’t close in will allow the sole of your shoe to get in contact with the floor and thereby provide you more slip-resistance. The more contact the sole allows with the surface, the more slip-resistant the shoe is. I have a problem with overpronation/underpronation. Is there a guide for choosing which Puma shoe would suit me best? Yes, there is. Overpronators should pick sneakers that have arch support, deep heel cups, low heels, or motion control features. People with mild to moderate overpronation should choose shoes with firm midsoles while those with severe overpronation need a straighter instep and stiffer heels. For underpronators, shoes that are light with a great deal of padding would counteract supination (underpronation). They should also be extremely receptive to the feet and made of adaptable materials. How do I take care of my Puma sneakers? Clean your Puma sneakers immediately after use if they have been through mud or exposed to too much dirt. Use your Puma sneakers for their intended purpose. Your lifestyle Puma sneakers may be versatile, but it won’t hold up too long if you use it primarily for running. Air dry your Puma shoes after cleaning. If the insole is removable, remove it, and air dry separately. You can help retain your shoes’ shape by packing it with crumpled newspaper. How do I clean my Puma footwear? For leather: Wipe your Puma sneakers with a soft cloth dampened with mild soap and cold water. For canvas and nylon: Gently scrub the upper of the shoe with a soft cloth soaked in soap and cold water. Air dry. For synthetic leather: A soft bristle brush or soft cloth can be used to scrub the shoe’s upper. Use mild soap and cold water. Air dry. For suede and nubuck: Use a brush specifically made for cleaning suede to keep the outside of the shoe clean. Puma is a German company and has been based in the town of Herzogenaurach in Germany since 1948. They also have a U.S. corporate office in Boston. Where are Puma products made? Puma SE currently has more than 170 factories located in 26 countries with the majority of them in Asia and Latin America. A few others are located in Africa and Europe, including Madagascar, South Africa, Germany, Italy, and Ukraine. How did Puma get its name? Puma was first named Ruda (for Rudi Dassler) before it got its current name. Rudi wanted his products to embody strength, speed, agility, endurance, and suppleness and the Puma cat was all of those. 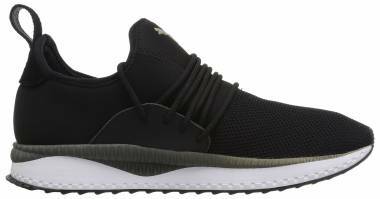 What is the Puma Formstrip? The Formstrip is another known brand logo of Puma created in 1958. It was originally intended as a shoe element to stabilize the foot inside the footwear but is now used as a brand trademark in their shoe and apparel lines. Who designed the Puma logo? The Puma logo has gone through a few tweaks and even complete overhauls but the most popular one which is still recognized to this day is the one designed by cartoonist Lutz Backes. Lutz, in 1968, rendered a minimalist logo of the leaping Puma cat which conveyed power and strength. This logo would, in turn, be updated a bit in 1971 to the logo we now know today—the cat leaping over the Puma wordmark. How do I ensure I get a good fit when buying a shoe? The material does play a role in getting the perfect fit. Leather can be broken in while other materials can not or may prove difficult to. Some mesh fabrics can be stretched to accommodate the foot but not all can. A lot of people have one foot that is slightly larger than the other. Make sure to fit your shoe to the bigger foot to get your size. Also, take your measurement at the end of the day because that is when feet are largest. When fitting a shoe, do stand up and make sure there is at least ⅜”to a half-inch of space between the end of the shoe and your longest toe. Here are some little interesting facts about the beloved brand that you might like to know about. Rudolf and Adi Dassler were brothers who founded the Gebrüder Dassler Schuhfabrik (Dassler Brothers Shoe Factory) in the 1920s. Adi designed the shoes while Rudolf marketed them. They built a successful business and had their shoes worn by African-American track legend Jesse Owens when he won four gold Olympic medals in 1936. The two brothers had a famous falling out which led to them splitting the company in 1948, assets and employees. Adi Dassler named his company Adidas. Puma was originally named Ruda for Rudolf Dassler. Rudolf initially registered his company as Ruda after his name before later changing it to Puma. The catalyst for the brothers’ bitter feud occurred during World War II during the bombing of Herzogenaurach by the Allies. The brothers’ relationship was already strained at that point but as Adi was climbing down into the shelter, he was said to have remarked, “The dirty bastards are back again.” Rudi, already in the shelter, thought the remark was aimed at him instead of the Allied forces. Rudolf or Rudi was arrested by Allied forces on suspicion of aiding the Gestapo and was imprisoned in a POW camp for years, only returning in 1948. He suspected Adi of ratting him out. During the years that the brothers Adi and Rudolf were fighting, villagers in Herzogenaurach—the town that is home to both Adidas and Puma HQs—would decide whether you are a friend or not based on the shoes you wore. The town carried the nickname “Town of Bent Necks” because people looked down at the shoes you were wearing before deciding if they would talk to you. Puma people did not date nor marry Adidas people. Some businesses allied with one side did not serve those who supported the other side. When both Rudolf and Adi died, their graves were placed on opposite ends of the town churchyard, signifying their unending hatred of each other. The two companies only buried the hatchet in September 2009 through a friendly football game. In Puma’s nearly 70 years of history, the company has always strived for a culture of “first.” It has led the way to many innovations in the field of footwear in both sports and fashion. 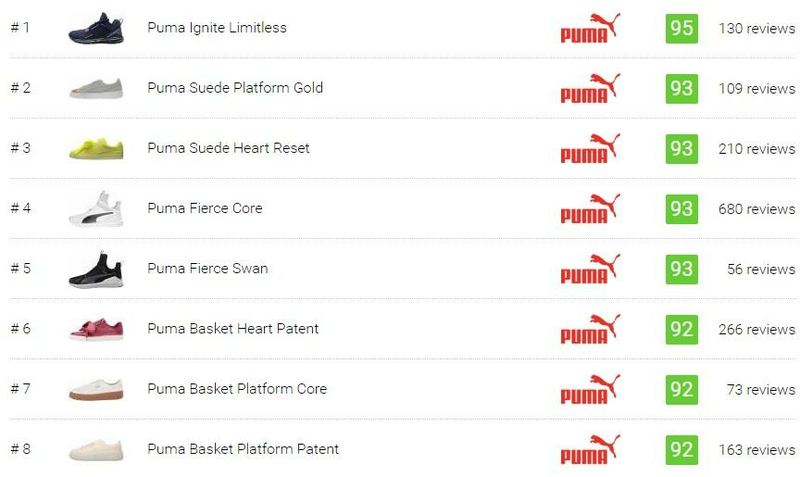 Here are some of Puma’s firsts. Puma was the first to create a football boot with screw-in studs—the Super Atom. They were the first sports shoe company to utilize the vulcanization technique which is bonding the shaft of the boot with its sole. During a time when football shoes were made using smooth leather uppers, Puma broke the mold by producing a shoe with a textured rubber on the footwear’s vamp. Puma was the first to use kangaroo leather in Puma sneaekers. The Puma King came out in 1970. Fixed cleats were the norm for cycling shoes in the 70s. Puma created a shoe with flexible cleats that could be positioned and repositioned depending on the rider’s needs. This shoe was called the Olympia Sprint. Puma was the first sportswear brand to design a shoe specifically for a Formula One driver, Stefan Bellof. Armin Dassler, Rudi’s son, invented the Duoflex sole for Puma sneakers. This sole had special slots for increasing the foot’s resilience and came with conical shaped studs that increased traction. This innovative technology paved the way for the modern molded flex zones being used today. In 1986, the Puma RS shoe was already helping athletes track their calories burned, distance covered, and speed. Puma was the first shoe company to go laceless by using a hook and loop system in the 1960s on Puma sneakers. They updated this further by creating the Disc lacing system in the 1990s. Puma was the first to combine sports and fashion, paving the way for athleisure Puma sneakers. Puma designed the world’s lightest football shoe, the v1.06, which weighed only 200 grams. It also featured an upper that mimicked grass to disguise the feet of the players from their opponents.